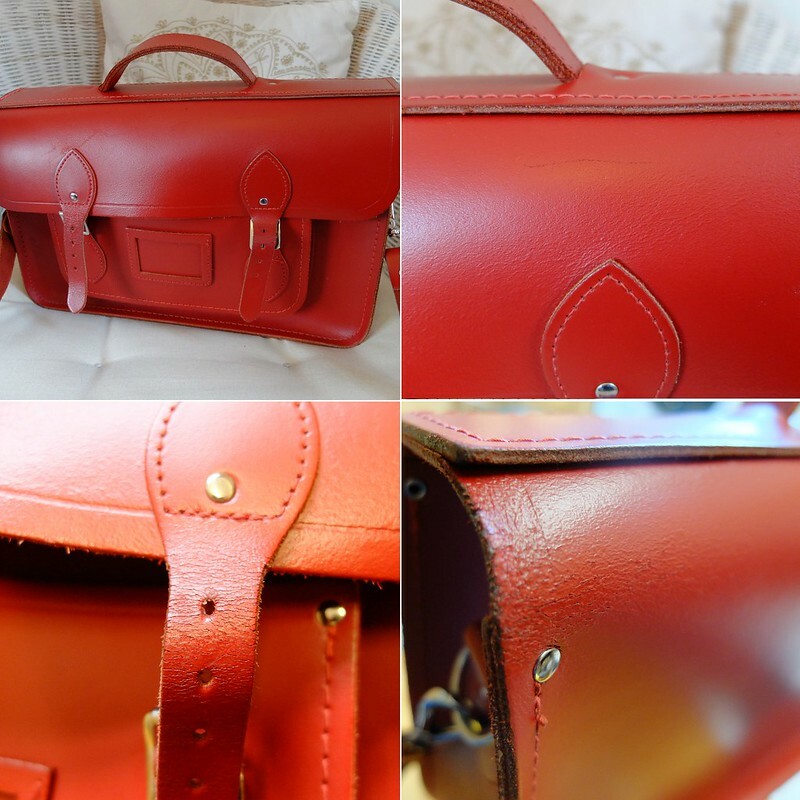 Do you ever find beautiful vintage leather goods in the charity shops yet leave them there because you think the leather has deteriorated to the point of no return? 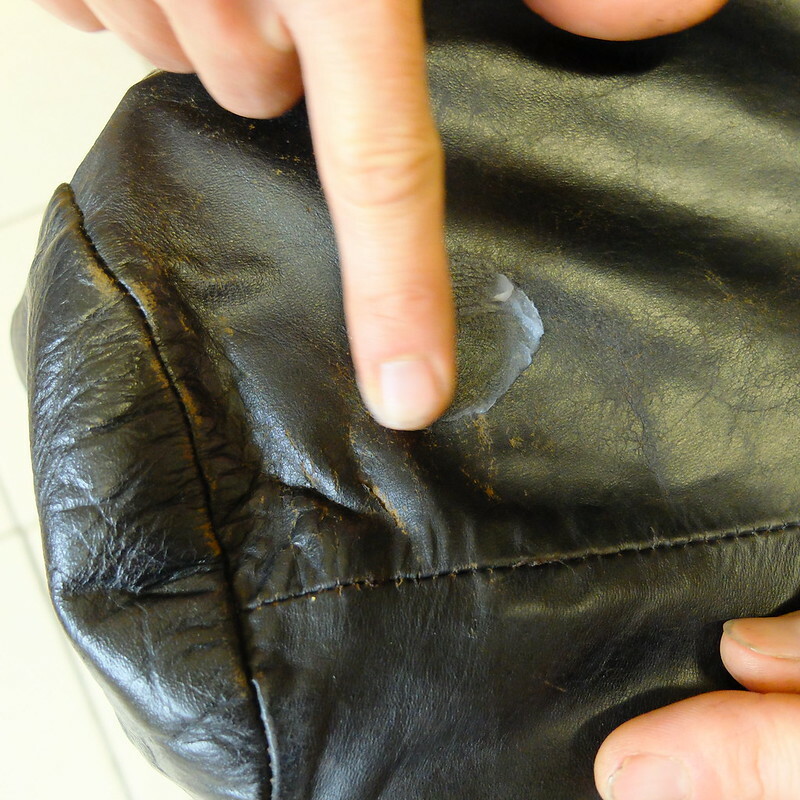 Whether it's handbags, shoes, jackets or a piece of vintage furniture, leather can crack and dry as it ages and gain a layer of unsightly dust and dirt. 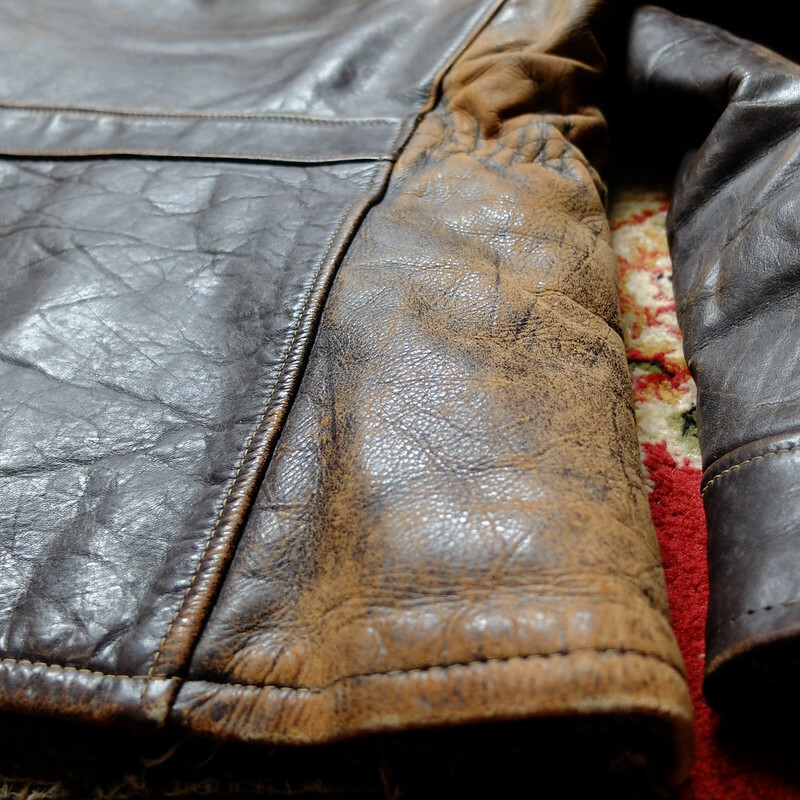 Leather needs special products to both clean and put moisture back in - don't be tempted to use home remedies such as olive oil, as this can seep back out in patches, ruining your items for good! The good people at Chambers are specialists in leather care, and were kind enough to send me a selection box of their products to test out. Included in the kit was a leather cleaner, two types of nourishing balsam, and a leather waterproofer. Here's how we got on. 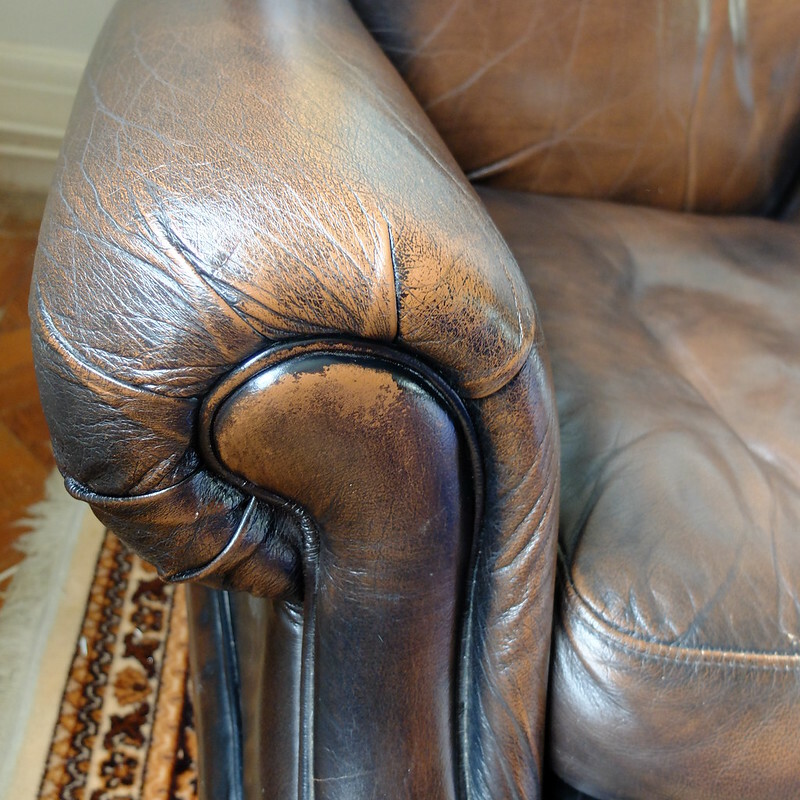 Our leather sofa and chairs are in pretty good condition, so there wasn't really anything noticeable happening with the cleaning and nourishing. The arms of our chairs do get hit by the sun a little, and that's probably the area that needed attention most. Although you couldn't tell from the sofas themselves that they'd been cleaned, the cloth that was used came away quite dirty, so the cleanser must have done some good! The balm left the leather feeling supple, whereas it had started to feel a little dry previously. It's not vintage, but my beloved Cambridge Satchel gets a lot of wear as I take it to work. It's started to get a bit of cracking on the straps and some of the edges. It also has a few biro marks from when I've been trying to make notes on the train. I tried the cleanser to see if it would shift the pen, but it didn't really seem to do anything. A quick application of the balsam left the bag feeling much softer though, and hopefully the leather will stop cracking quite so much now. Obviously the balsam can't reverse cracking, but it can help stop more developing. 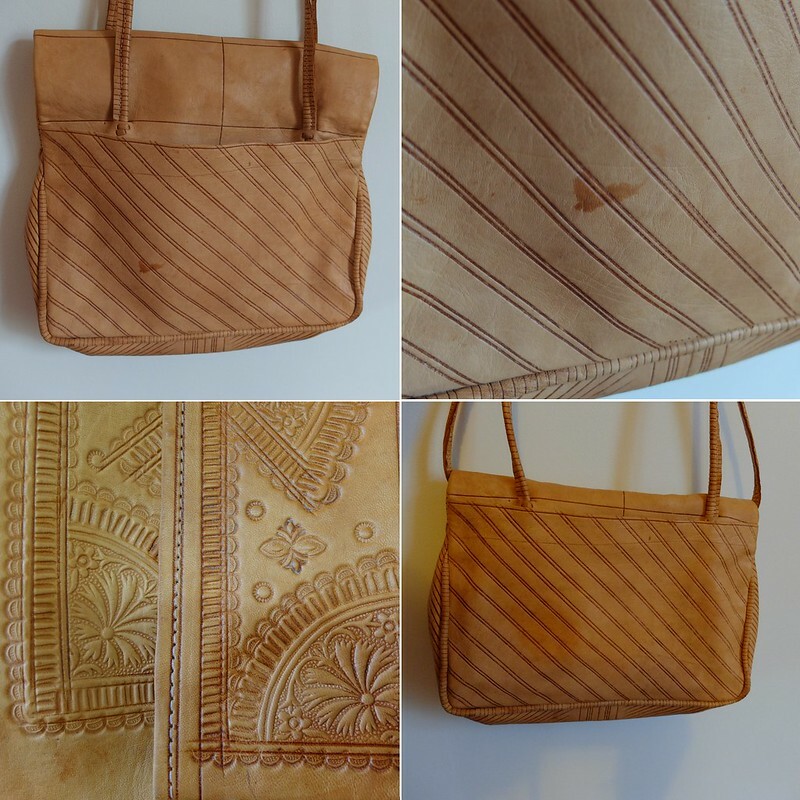 The next test was on a simple leather bag that the husband-to-be forced me to buy in a charity shop because it was only £1. It was slightly anaemic looking, and had a splodge of a stain on the back. A quick dose of the leather cleaner, and it came off easily. You can see in the bottom right photo how the stain was lifted (the slightly darker area is because it was still wet). I tried the balsam then and was impressed how it gave the bag nourishment, but also a tad more colour. It's like fake tan for bags! The bottom left photo shows the untreated section on the left, and the treated on the right. The balm is colourless itself, but inherently if you're adding more moisture in then there might be a slight colour change. I'm saving the best until last, because you won't believe how good this stuff is for resurrecting vintage leather jackets from a fate worse than death. I didn't do the leg work on this one, I left the husband-to-be alone for the afternoon and came home to find six leather jackets hanging in the hallway. He really liked how the products worked on the first jacket so he just kept going! 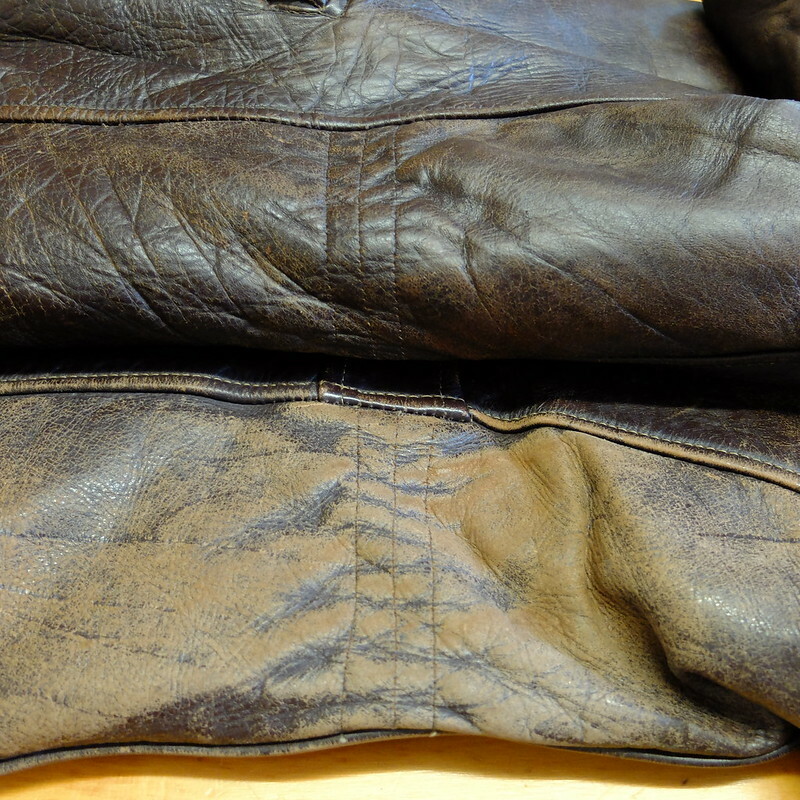 These next two photos show how a particularly old and stiff jacket was before - as you can see, there are large patches of dry discolouration. The photo below is halfway through the treatment process - the top section is treated, and the bottom is yet to be done. It's an incredible difference. 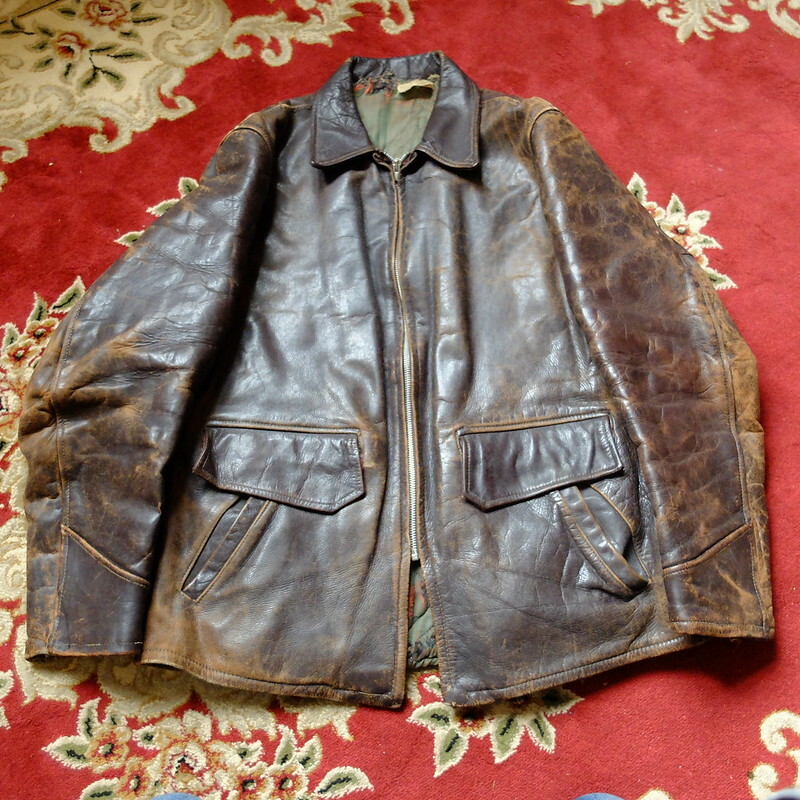 The finished treatment below has given a new lease of life to this jacket. 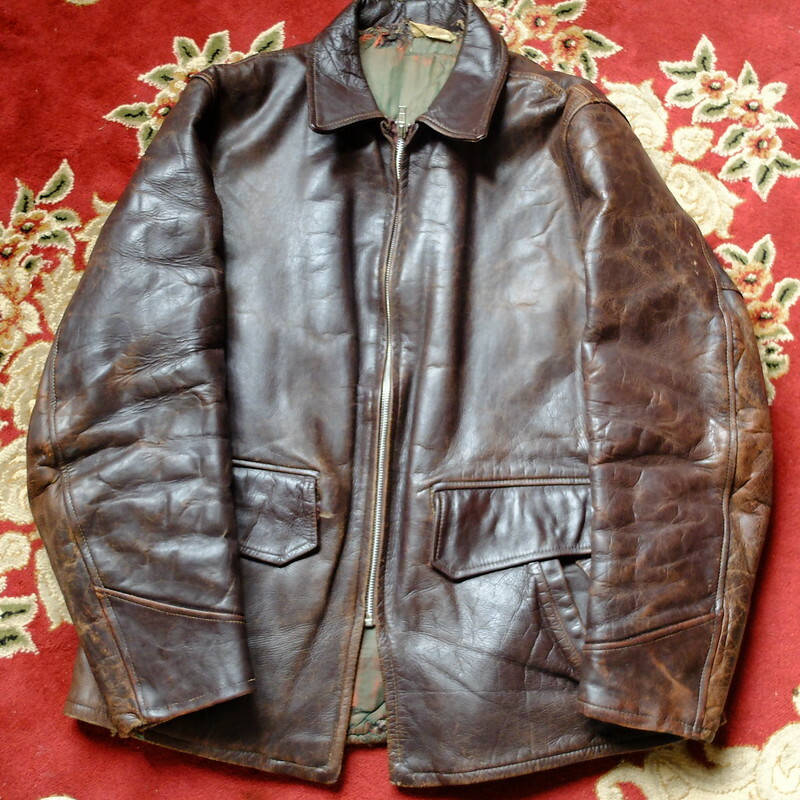 It's quite an amazing jacket from the 1940s, and will be featuring soon in its very own post! The whole process is easy-peasy. Using the cleanser needs a sponge and a damp cloth, and using the balsams you can just use your fingers, as the heat from your hands helps work the product into the leather. The products are competely natural, so you don't have to worry about your skin. The husband-to-be was actually complaining that the balm made his hands soft (he needs hardened skin to play guitar). In summary, the cleaner lifts dust and dirt and removes water marks, but will not shift tough stains like pen. The balsams are miraculous little pots that will revive dried out leather and give it the most wonderful protection and shine. We haven't finished testing the leather waterproofer yet, but have been giving it a go on some vintage men's shoes, so I will get back to you on that one. 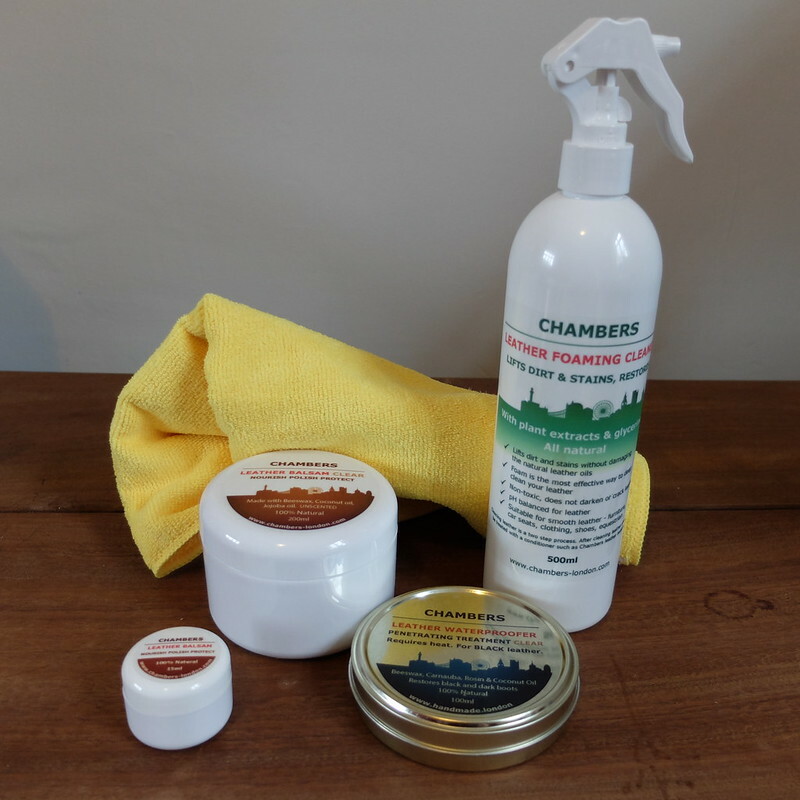 Overall I was terribly impressed with these products from Chambers, and I think it's testament to the quality of them that we now have a bit of a production line going on with shoes, jackets and bags! We will not hesitate to part with our own hard-earned cash when we run out to replenish our supplies. Chambers sent me a leather-treatment kit for review. All words and opinions are my own. The jacket transformation is night and day. Wow! I don't think I've ever seen anything bring leather clothing back that substantially before. Thank you for the introduction to this cool line. Bookmarked for if I ever need to breath new life into old leather (assuming they ship abroad).